Dragon Quest Heroes – Someone Backstab Him Already! 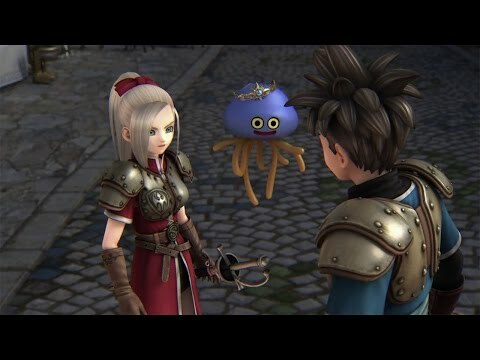 Spoilers for the plot of Dragon Quest Heroes below. For much of the game, my intrepid band of heroes has been searching for the Circle of Light. It’s the counterpoint to the Circle of Night, and is the thing that will help them save the world and you’ve heard all this a million times before… Anyway, they don’t know where it is. In a totally unrelated situation, they have a friendly Healslime named Healix, who wears a thing that his dad gave him which is supposedly a super important treasure that just happens to resemble a golden circlet. At the start of the game, Healix is friends with Aurora and Luceus (the teenage main characters). Some crazy black magic wave hits, and every single monster in the area suddenly turns evil, except Healix. Okay, maybe he just got lucky. Later in the game, Velasco (the bad guy) has our heroes trapped. Healix charges at him, and Velasco reacts when he sees what Healix is wearing as if he recognizes it and is afriad. Healix can’t get to him because he’s in a sacred spot that only the Children of Light and Night may enter, which Healix is not. Velasco then laughs it off, claiming it’s absurd to think a Healslime would posses the Circle of Light. Okay, maybe it’s a replica or something. After this, Healix gets depressed that his treasure is apparently nothing important, and runs off. Our heroes go to ask the Goddess for help, and lose track of where Healix is. The Goddess tells them flat out that the Circle of Light can be found in the Shrine of Scales. He’s Distracted, Someone Backstab Him Already! The villain is named Velasco, who is a robed wizard with a mustache and a Spanish (so my wife says, I thought French) accent. First of all, it’s a delight how varied the accents are in this game. It actually sounds like people are from different places, rather than everyone sounding American. Secondly, Velasco is competent. He is always one step ahead. He has an army and doesn’t care about it’s well being. He knows far more about what’s going on than the heroes do, and constantly reveals just enough to lead them to where he wants them to go. He’s a smart villain. Oh, and he loves to monologue. Which to the teenage heroes, is really annoying as they stand, listen, and then throw back retorts. At one point, this is happening while Velasco and Luceus (the male in blue in an earlier screenshot) are fighting, and Velasco is using his staff to parry Luceus’ sword in a dramatic pose. Aurora (the girl in red) is behind Velasco. She mostly watches. At this point, I was screaming at my TV for her to put brains before heroism, and just stab him in the back while he’s distracted. Instead, she let him monologue, summon a boss monster, then escape to put the final plan for the world’s ruin into motion. You know, I get that the hero wants to have a dramatic final showdown between good and evil and all… but maybe if the fate of the world hangs in the balance due to this guy who has been beating you the entire game, and you get the chance to end it by fighting dirty, you should take it? This particular one got me thinking about Avatar: The Last Airbender again. Letting people monologue and transform is such a trope in games and animation that we just go with it, to the point that when Azula didn’t go with it and fried Aang midway through his powerup sequence, it was a shocking moment. It also proves that Azula is a much smarter teenager than the heroes are here. Fortunately, I don’t find this stuff detracts from the game, for me. It’s been quite a lot of fun, and the story having these silly things in it is kind of part of its charm.I’m not sure someone who didn’t grow up on JRPGs and anime where these tropes are so widespread would feel the same way, but when it’s not taken super seriously I find it works. Indeed, the biggest worry I have about this game is that not a lot of people seem to be playing it. They’re making a sequel in Japan with multiplayer, and I hope we get it, but that requires people to buy the first one here in North America. Multiplayer would be great in this because you have 4 heroes on the map already, so it’d just let two of them be player controlled instead of one. I am still considering. I am new to the whole series/genre, so I am hesitant on that front alone. I don’t always like mindlessness, but the DQ setting appeals to me. The real nail in my pledge to buy it at launch however came when I found out there’s no multiplayer at all. I was really hoping to co-op the game with my girlfriend, but controller swapping solo runs doesn’t sound nearly as much fun for this kind of game. Yeah, the no MP is a drag, especially since the game is really well suited to it. They’re already working on a sequel for Japan, and *that* one has multiplayer. At this point, the only question is if this game sells well enough that they bring the sequel over.